Air-piping made of plastics according to this offer is determined for industrial use in highly corrosive atmosphere, above all. The advantage of the air-distributing products made of plastics is their high chemical resistance, long service lifetime, low weight and simple assembly. The most used applications are systems of polluted air exhausting from various technological processes (e.g. chemical plants, galvanizing shops, hot zinc dipping shops, metal pickling , chemical polishing and glass etching, neutralization of acid sewage, ventilation of stores with chemicals, etc.). Parts of the air-distributing ducts are made by welding from plastic sheets (heat-shaping, or cold bending), or extruded from tubes. Connecting of piping parts is carried out with flanged connections, spigot-and-socket welded joints, or spigot-and-socket glued joints. The producer solves the constructional and material design of the air-distributing ducts and all their components individually, for a specific use according to the working conditions and with respect to the client's specific needs. 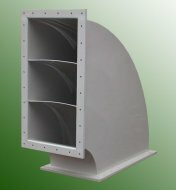 The delivery of the air-distributing system may be implemented as the item delivery of individual components, the delivery of components including their assembly, or in the form of the complete delivery of the air-conditioning equipment including the design and the equipment for the air purification. Each business case is solved individually according to the client's needs and requirements. Required material of components and accessories, or specific determination of working conditions (chemical and physical composition of air, situating the air-conditioning ducts, surrounding temperature, the other outside effects, etc.). We provide expert's consulting during elaboration of the data. Circular air piping is made of plastic PP-H (polypropylene). Angular air piping is made of plastic PP-H (polypropylene). Circular tubes for air piping are made of plastic PP-H (polypropylene). Atypical elbow DN 1200 for air piping is made of plastic PP-H (polypropylene). Angular elbow for air piping is made of plastic PP-H (polypropylene). Hand-operated gate valve DN 600 for air piping is made of plastic PP-H (polypropylene).